To prep for the one-day-only sale, try your luck to spin and win discount codes worth up to S$80 when you visit the ChopeDeals Foodie Paradise Sale page between 21 to 27 March. On the day itself, set your alerts for three flash deals that will start at 10am, 12pm, and 6pm, for a good range of steals as crazy low as S$1. For an extra perk, when you purchase vouchers and pay via DBS PayLah!, enter the discount code <PAYLAH10> to drop S$10 off the total amount (with a minimum spend of S$50). Note that this code is for one-time use only and is valid for the first 1500 redemptions. Top up your PayLah! account or enable the Auto Debit function to make sure you have sufficient funds in your wallet! 1. Head to ChopeDeals or the app to choose an offer from their curated list of available restaurants. 2. Purchase the voucher and retrieve it from your email or via the Chope app. 3. At the restaurant, simply inform the staff that you will be using your voucher prior to ordering. Then redeem it by presenting your voucher to offset the bill and enjoy your savings! With so many spots and nosh all over Singapore to choose from, here are some we’ve sampled with some other highlights we recommend as must-tries for ChopeDeals Foodie Paradise Sale 2019! Clinton Street Baking Co. & Restaurant from New York City’s Lower East Side is best for breakfasts, lunches, and weekend brunches. 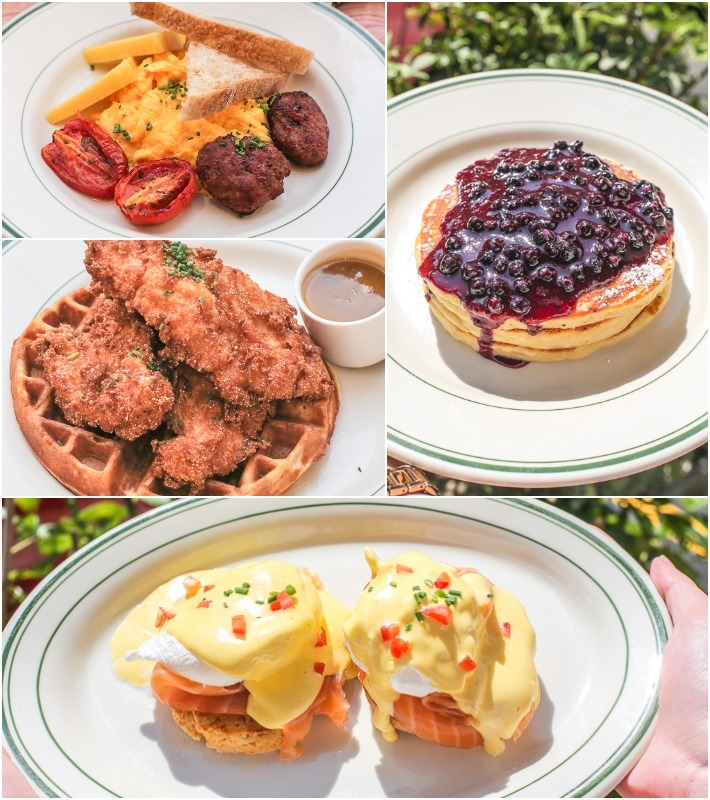 Fancy a New York brunch experience? This spot is nestled amongst a slew of cafes and eateries that Purvis Street is home to. You better be getting their blueberry pancakes with an order of Pancakes with Warm Maple Butter (S$19++) for decadence at breakfast. But if you would rather have savoury Chicken & Waffles (S$21++) over fluffy pancakes, Clinton’s has chunky chicken with fried seasoned skin perched atop a soft vanilla buttermilk waffle. Pay S$50 for S$100 cash vouchers through ChopeDeals. Don & Tori is a modern Japanese restaurant that sets the bar pretty high for dons, makis, and yakimono (grilled or pan-fried) items as long as you’re not a purist. It’s a serene enclave in the Central Business District that joins the heavyweights on Tras Street. Their live sushi bar will entertain you as you watch your orders being assembled and made. Scallop Butter Yaki (S$25++) is a very decadent light bite with grilled scallops bathed in richly buttery sake. For a filling rice bowl, their Hokkaido Don (S$26++) is a briny union of tuna mince, salmon roe, plump scallops, and caviar toppings on appetisingly marinated rice. A must-try maki is their Unagi Foie Gras Maki (S$25++) that has a crab meat core. Pay S$25 for S$50, S$70 for S$100 cash vouchers through ChopeDeals. Duck is one of our favourite proteins ever. This new restaurant prides themselves on using award-winning Silver Hill ducks from Silver Hill Farm in Ireland — the A5 ‘wagyu’ breed of ducks. Their impressive variety of both Asian and Western-style duck dishes raises the bar for duck meat with theirs being especially succulent, tender, and robust. A must-get is their signature Roast Irish Duck (S$28 for a half, S$50 for whole) with crisp amber skin and moist meat that melts in your mouth with a range of dips. Their Duck Confit & Waffle (S$20) is intensely flavourful even without fancy twists. For something quick and fuss-free, their Black Pepper Duck Pie and Tomato-Pineapple Duck Pie (S$6 each) won’t disappoint. Pay S$35 for S$50 cash vouchers through ChopeDeals. A good place for a group hangout with a good selection of European nosh is at Marché Mövenpick. They have pizzas made-to-order, paella, all-time-favourite rostis, oysters, wholesome salads, and more. The classic Swiss Rösti (S$8.90+) is an item that everyone has to order. For sharing bites, we love the Margherita Pizza (S$18.90+) for its crunchy crust; it is cheesy and comes with tomatoes and basil. You’d love the Seafood Aglio Olio (S$20.90+) too, that comes complete with mussels and plump prawns. How often can you get a four-patty burger? You don’t have to head down to pasar malams for your ramly burger fix because Ministry of Burgers, one of the new joints at White Sands Shopping Centre, orders from the same suppliers! What’s even better is that their patties are thicker and weightier. Go with your mob of hungry souls (pun intended) for their MoB Thunder (S$9.90) and customise a mixed patty choice of chicken, classic and hearty beef, or crunchy fish fillets. But if you’re coming in pairs and are looking for something smaller, on promo is their Double Patty Ramly Burger. It comes with the same crepe thin egg and sauces like black pepper that’s honey-sweet and tangy. Pay S$5.90 (U.P. S$11.80) for their 1-for-1 Double Patty Ramly Burger through ChopeDeals. PizzaExpress doesn’t just sell gourmet hand-made pizzas. This pizza chain from UK also doles out a range of Italian-style eats such as salads, pasta, and desserts that are made in-house and from scratch using only fresh, premium ingredients. Simple yet satisfying is their classic pizza range which comes in a variety of different flavours. The doughy base is slightly thicker and made fresh on the spot; yes, you can watch the chefs in action at the open kitchen. Pay S$15 (U.P. S$28.25++) for their Classic Pizza except Lava, Mushroom & Fennel Omnipork, Curried Beyond Beef Pizza through ChopeDeals. Ruth’s Chris Steak House is an upmarket steakhouse for when you want to sink your teeth into sizzling, butter-topped beef. Get cosy in an elegant setting with warm chandelier lights and soft jazz in the background as you ease into your meal. Slice into a Ribeye (S$80++ for 12 ounces, S$100 for 16 ounces) that’s bathed in butter and parsley. It is outstanding for being well-marbled and deliciously juicy when done medium rare. Their Sizzlin’ Blue Crab Cakes (S$35++) are two jumbo mounds for when you want some crab meat without the effort and mess of cracking crab shells. The drizzle of lemon butter lifts its intense flavours. Shahi Maharani specialises in North Indian cuisine. They continue to deliver traditional Indian cuisine passed down from the yesteryears of the maharajas. The space is decorated in muted tones with etched glass lamps and carved wooden doors. The Royal Seafood Specialities include a Prawn Korma that has cashew nuts blended with crushed cottage cheese and special spices as the main ingredients of the sauce in which the prawns are cooked. A bowl of green pasty thick deliciousness is their Palak Paneer which is a North Indian favourite. Cubes of wholesome cottage cheese are cooked in a creamy spinach sauce. 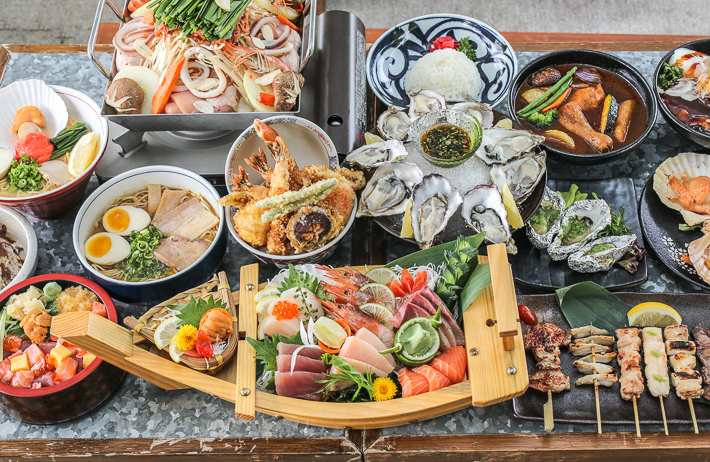 For a smorgasbord of Japanese cuisine, Tsukiji Fish Market Restaurant promises generous portions at affordable prices. With six unique dining concepts under one roof, they serve a wide range of the Japanese cuisine with ingredients air-flown from Japan’s famous Tsukiji Fish Market. If you had only one choice, go for the signature Tsukiji Special Bara Chirashi Sushi Don that comes with tantalising salmon, swordfish, tuna, salmon roe, and uni. Otherwise, there are dishes such as the Ebi-Zo Special Tempura Rice Bowl, Tori Tonkotsu Ramen, Chicken Collagen Hot Pot, and Wagyu Yakiniku too! If you’re looking for a family-friendly spot, Uncle Leong Signatures will see to your needs with Chinese eats. The restaurant is conveniently located in Waterway Point which is next to Punggol MRT Station. Here in their menu, you’ll find the best dishes specially curated from their other outlets. Start your main meal strong with seafood signatures such as Shimmering Sand Crab, Crab Bee Hoon Soup, or a “Chye Poh” Steamed Fish. Sambal Sauce Prawns and XO Sauce Scallops are just some of many mains for if you want to turn up the heat by a bit. Definitely, don’t forget their Nescafe Pork Ribs that’s with a super strong coffee fragrance that might remind you of your childhood candy Kopiko. We’re marking our calendars for 28 March 2019 and you should too. Be quick to cash in on the exclusive discounts because stocks are limited! It’s going to be a gastronomical day for a foodie-friend meet up and the exclusive dining deals will be the reason to take yourself and your loved ones out for a fine treat too. Go check out ChopeDeals Foodie Paradise Sale 2019 for the slew of delicious offers you’ll want sliding into your tummies now. This post is brought to you by ChopeDeals.